Be part of the online world's hottest phenomenon and create cool Instagram stories to promote your business. Browse our collection of over 4000 ready-made, amazing looking, Instagram story templates and pick one as a starting point. Customize the template and create a unique story. Upload your own photos, fonts, colors, and logo. Use the preset typography feature to impress. Create stunning animated stories. Animate your photos, texts or icons and make them come alive. Choose animation effects to make stories more interesting. Once you are finished, you can save your work as a .JPG, .PNG or .MP4 file and simply upload it to your Instagram page. You don’t need to know how to make an Instagram story from scratch; you can use one of our templates as a starting point. All you have to do is customize it with your pictures, colors, fonts, and logo. Add animations for a jolly effect and download it. No coding or design skills needed. Just create. 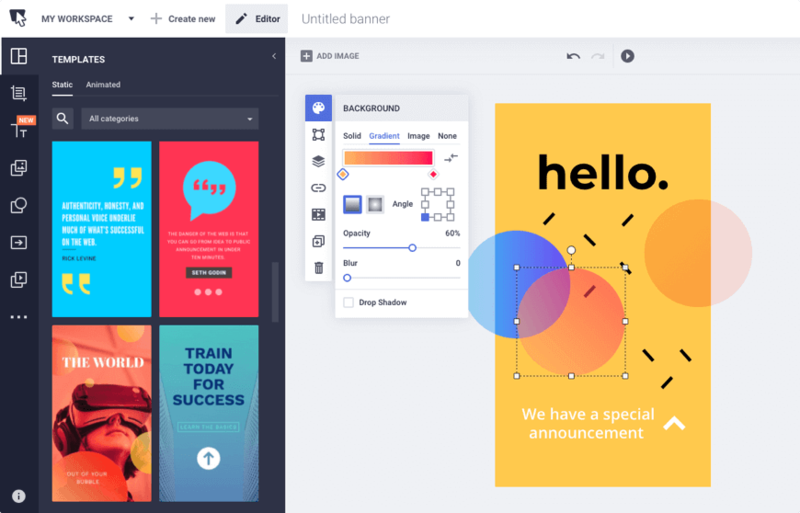 We've developed the internet's most performant and easy-to-use design tool to help you create beautiful visuals hassle-free. Keep up with Instagram's fast-paced rhythm and keep your followers engaged with surprising stories. Effortlessly create stories and post them to Instagram once a day, twice a day or multiple times a day. Never miss an opportunity to stand out! Whether you're looking to increase your brand's popularity or sell your products online, advertising through Instagram stories can make a huge difference. But remember, this is a place where you're competing against your followers' family, friends and favorite stars. Unless you publish relevant and catchy content, your brand won't be taken into consideration by people scrolling down the feed. So, you need high-quality visual content. Luckily, we can help you. Plus, include hashtags and links to drive people to your website! Create spectacular Instagram stories online to gain new followers, promote your business or sell. Don't worry about the designing part. We've got everything covered for you. This tool is so intuitive you will instantly be able to create an Instagram story, without any prior design course or skills. We’ve created tons of Instagram stories templates: from food & drinks to travel, how-to guides and sneak peek stories. Save money on your designs. You have free access to our database of professional stock images. Use as many pictures as you need to create your story! Instagram stories have made a name for themselves by using innovative add-ons, emojis, characters, and shapes. Browse through our collection of cliparts and pick your favs. In visual advertising, fonts can act as voices. Use one of our popular fonts to convey your brand’s message or upload your own. Use one of our eye-catching, ready-made typography presets to make your message pop and matter. Add animation effects to your design elements to make your story come to life. Bounce, slide, fade, blur, glow, roll, rotate or flip, make it a happy story! Browse through our collection of stunning templates, stock photos, and lively animation effects. All this in a neat and organized workspace where you can set up your own library and individual project workspace.